The fish I bought yesterday is destined to become fish soup. 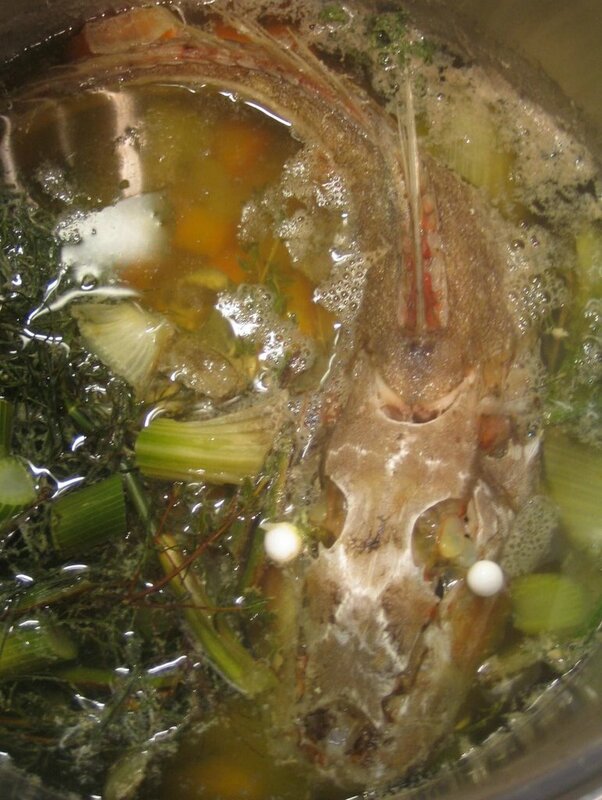 Fish soup needs fish stock, and that is what you see pictured above. Fish stock is so much quicker to make than a meat stock. All you need is some aromatic vegetables, herbs, some fish bones and to remember not to simmer it for more than twenty minutes. A too-long simmered fish stock will be bitter. The choice of fish is only governed by what you know about fisheries and their methods and the oiliness of the fish. Choose a white non-oily fish, and you may as well choose one that isn't too expensive. I had bought a whole tarakihi to provide the bones of the stock. Sorry. You can add some prawn shells if you have some from using the prawn meat in a different recipe. Use any aromatic vegetables you like - carrots, onions, fennel or mushrooms. The herbs could be thyme, fennel, bay or parsley. 500g fish bones, including the head and skin. This was one tarakihi minus its fillets. Put all the ingredients in a large pot and pour over one litre of cold water. Bring to the boil then reduce the heat to low and simmer gently for twenty minutes. Strain though a very fine sieve, through muslin if you like, discarding all solids. Leave to cool then refrigerate or freeze. I am always surprised that boiled up fish heads smell so nice!